I have a black and white layer in Photoshop. I want to drag and drop that layer quickly on another layer as a layer mask. Is it possible? 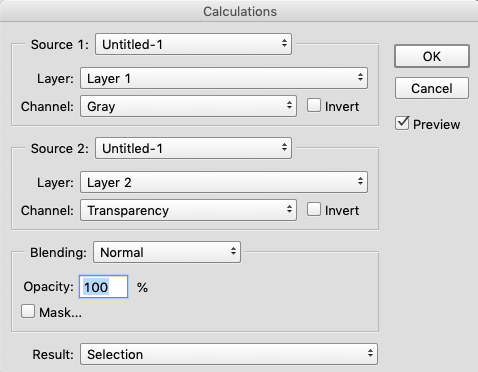 As far as I know there's no any shortcut to do that, but you can use Calculations to get the layer content as a selection and make the mask. No, you can't click and drag an image into a mask. There are various ways you could shorten the process. Here's one way. With the black and white layer fully visible, and any layers above that hidden, open the Channels tab. CTRL+click on any channel to make a selection. Go back to the layers, hide the black and white layer. Select the layer you want to add the mask to, and hit the layer mask icon. The mask will be added to the layer. Not the answer you're looking for? Browse other questions tagged adobe-photoshop layers mask shortcuts or ask your own question. Photoshop CS5, how to create a layer mask from a layer? How to copy a vector mask to another layer in photoshop cs6? How do I paste into a layer's mask in Photoshop? how do I paste into a layer mask?